After my first few weeks at home with a newborn, I'm already figuring out that I have to adjust my cooking style a bit if I plan to eat ever again! 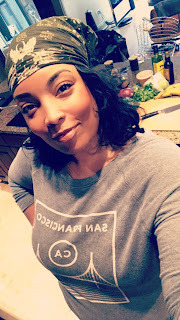 Gone are the late nights of marathon cooking (at least for now) and instead, I'm in search of recipes that are a little easier to prepare. That means dishes I can get done while Raven naps, or are forgiving enough that I can prep in stages when I have chunks of time throughout my day. I can't tell you how many times I get started on a dish and end up having to stop and tend to a hungry baby girl... sometimes it's a couple hours before I'm back in the kitchen! At any rate, this dish fits perfectly into that category. 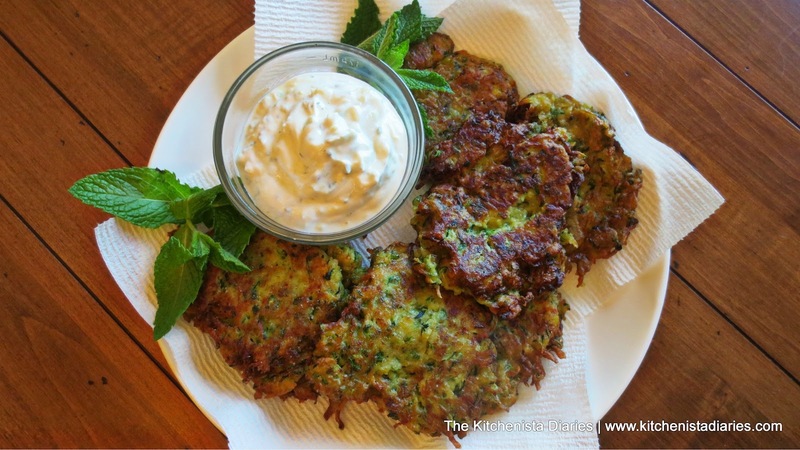 The shredded zucchini and yogurt dip can be prepped in advance if necessary, and then it's pretty easy to get the fritters mixed up and fried later. Also, much of the prep work can be done in the food processor! Even if you don't have kids squeezing your schedule, that kind of planning is great to learn if you ever need to entertain at home. I don't know about you but I tend to get excited when we get closer to summer and zucchinis come into season. Yes, they are available all year but they tend to be bigger and less expensive in season. They've gotta be one of the easiest veggies to get on your plate, whether you enjoy them in baked goods, raw salads or as a warm side dish. My favorite way to eat zucchini is simply sliced and sauteed in olive oil with a touch of garlic, red pepper flakes and fresh mint. 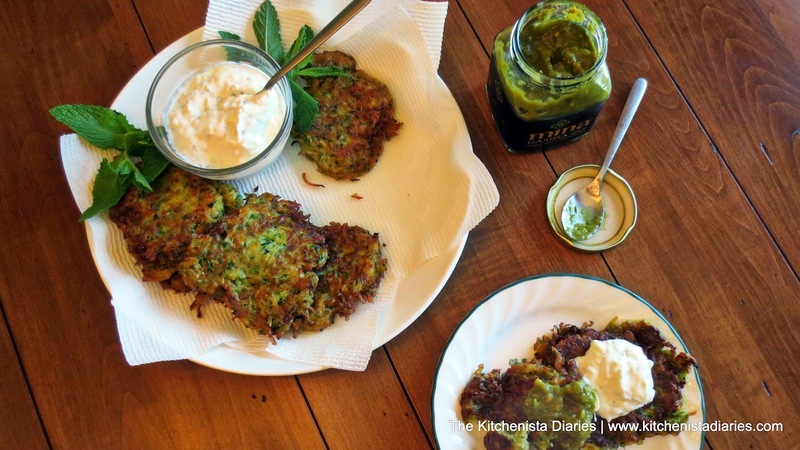 I wanted to play around with those flavors in a new way, so I took a pretty familiar preparation of zucchini fritters and spiced them up with a Moroccan twist by way of spicy green harissa! 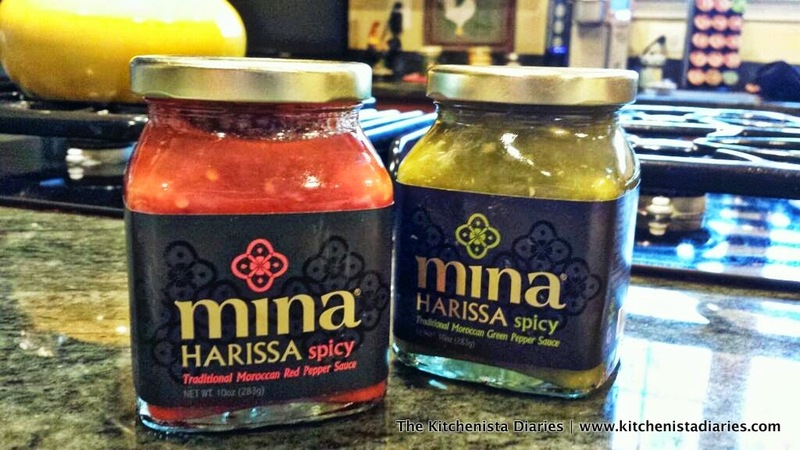 Mina Harissa recently sent me a couple jars of their pepper sauces to try. I was so excited to get my package and welcomed the opportunity to discover creative ways to use one of my favorite condiments. I've been familiar with red harissa for awhile - it's the secret weapon in my Moroccan glazed chicken wings - but Mina Harissa has a delicious green harissa that I was excited to use for this recipe. Instead of traditional red chiles, the green harissa uses (you guessed it) green chili pepper and green bell pepper, but also a touch of cumin which adds a nice warmth to the sauce. When I first started using harissa a couple years ago, the only place I could occasionally find it was at the farmer's market. Luckily harissa's popularity has surged over the past year, so it's awesome to be able to pick up a jar at the grocery store now. I've spotted Mina Harissa in the international aisles at both of my usual stores, so look out for it on your next trip! Equipment Needed: Large skillet or frying pan; food processor is helpful. Wash your zucchinis, chop off the ends and grate those babies up. You could use a box grater, but this is one of those recipes I welcomed the use of my food processor. I don't know about you but sometimes it's a pain to drag that thing out and have to clean it afterwards for one or two steps. However, if I can do most or all of my prep work in it for one recipe, priceless. Zucchinis hold a lot of excess moisture so the first thing you'll want to do is salt them, which will help draw out some of the water. If you've made a cucumber salad or tzatziki sauce, you've likely used a similar technique to prevent a watery dish. 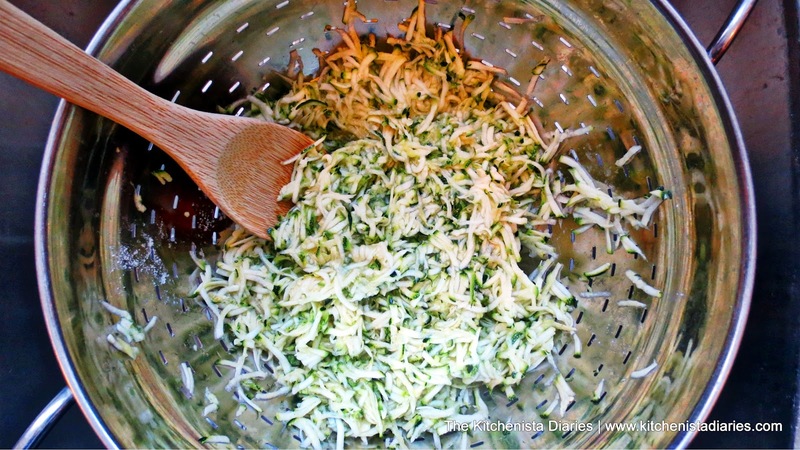 Place the grated zucchini in a sieve or colander and toss with a heavy pinch of kosher salt. Set your colander over a large bowl or in the sink. Leave it to drain for at least 30 minutes. If you get stuck in baby world for a couple hours as I did and forget about your zucchini draining, no harm done. 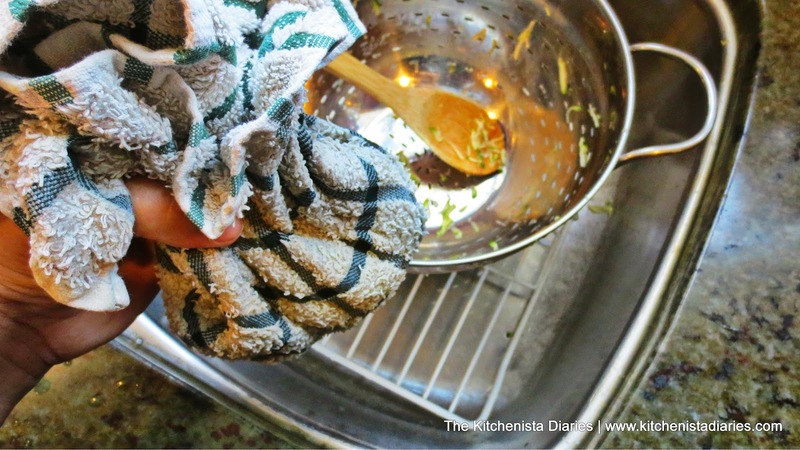 When you come back, use paper towels or an old dish cloth to squeeze the excess liquid from the zucchini. I think the dish cloth is easier because it won't rip or stick to the zucchini. 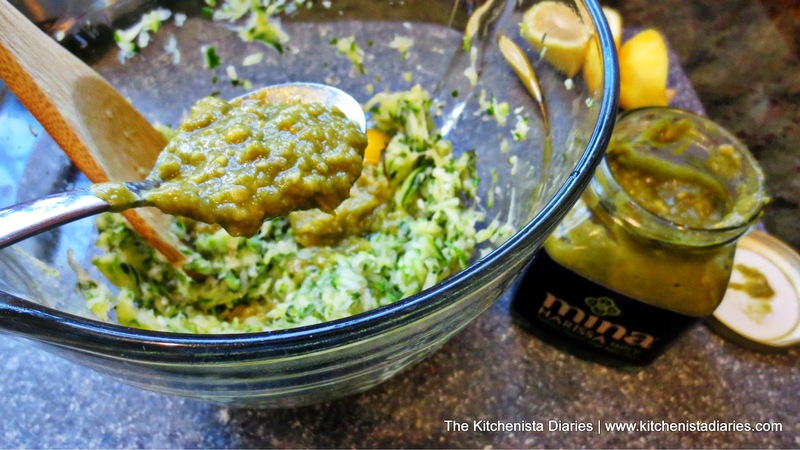 Transfer the drained zucchini to your mixing bowl and gather up the remaining ingredients. Say a silent prayer that your baby stays asleep long enough to get this done. 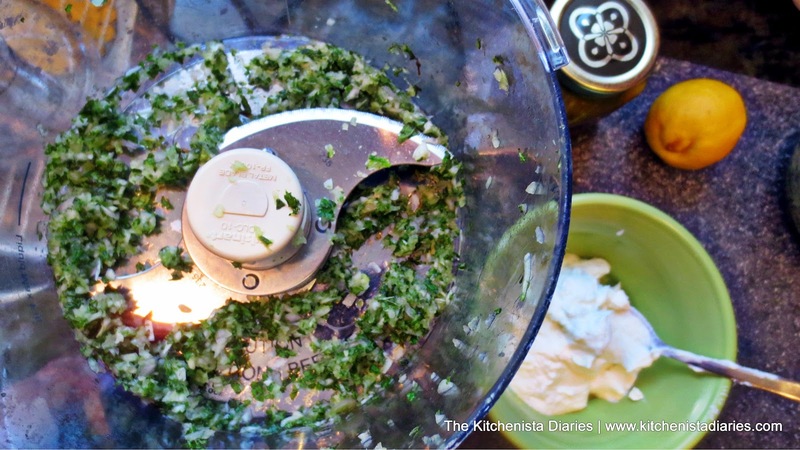 I used my food processor to pulse the mint leaves and shallot together, since they are both used to flavor the fritters and the yogurt dip. No need to prep the same ingredients twice. 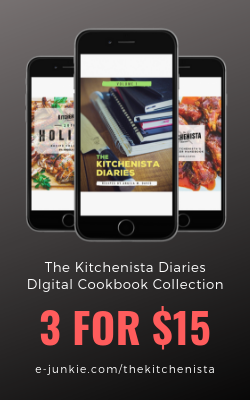 As Ina Garten would say, "how easy is that?" 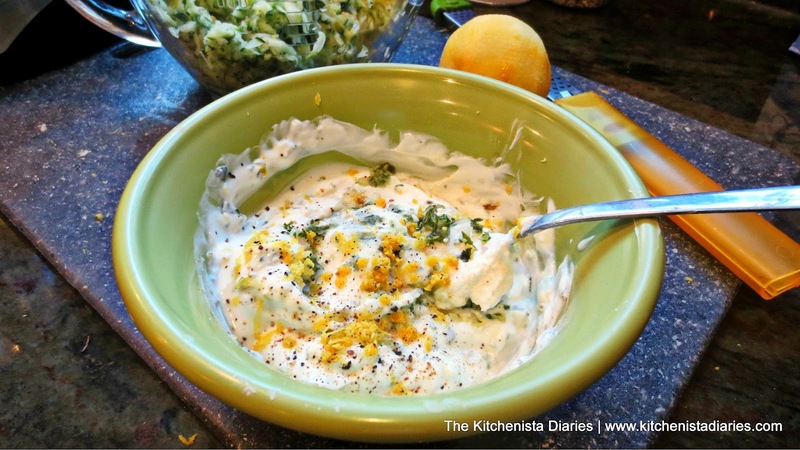 To make the yogurt dip, stir in a heaping tablespoon or so of the minced mint and shallots from the food processor into your Greek yogurt. Add the cracked black pepper, a little bit of grated lemon zest, and about a teaspoon of lemon juice. Before you cut open the lemon though, grate the rest of the zest into your mixing bowl for the fritters. Do you ever feel like you are going to waste lemons just using a squeeze or two here and there? If I don't need them for other parts of my recipes that day, I just slice up the lemon and toss into my water jug for drinking. After all the ingredients are folded in, add a pinch of salt and taste the dip to make any adjustments. Chill your dip until serving time; the flavors will continue to come together after it sits for a few minutes. Now, onto mixing up these fritters. You should have already added the lemon zest. 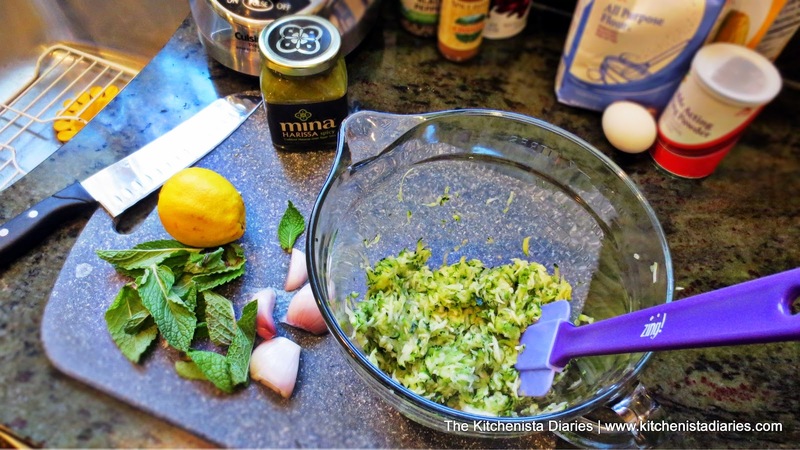 Stir in the minced shallot, mint leaves, some black pepper, and the green harissa. At this point you can do a quick taste test if you want to adjust the level of spiciness. I wouldn't add too much though, because it affects how much flour will be needed to bind the fritters. I also didn't think more than a tiny pinch of salt was needed, because the zucchini was salted in the first step. Stir in the beaten egg last. Finally, add the dry ingredients - flour, baking powder and cornstarch. 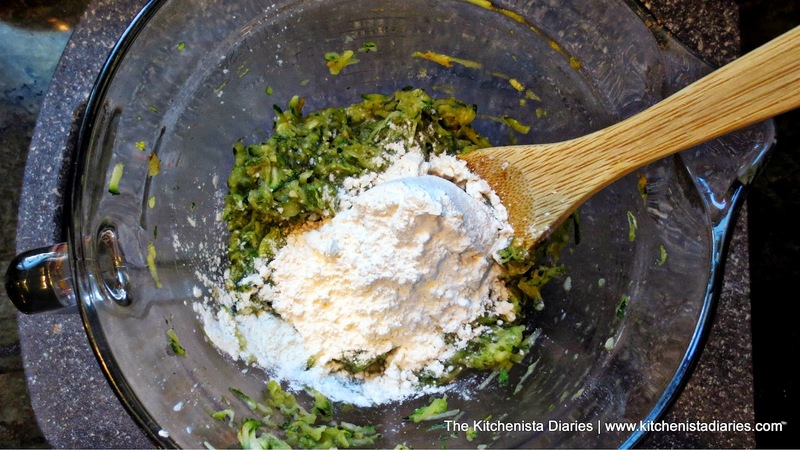 I added a little bit of cornstarch to this recipe to help keep the fritters crisp. If you are vehemently opposed to using it, feel free to replace with an equal amount of flour. Mix everything up just enough so that no flour remains visible. Preheat a large skillet over medium high heat. Add enough olive oil to cover the surface for a shallow fry. You don't want to waste extra virgin olive oil for this, so just use one labeled "light." Grape seed, coconut or canola oil would also work here, I just prefer the bit of flavor olive oil imparts. Drop batter by the 1/4 cupful into the oil once hot; it should sizzle immediately. The batter should spread into patties about 3" wide, so only do at one time what can fit in the pan as shown in the picture below. 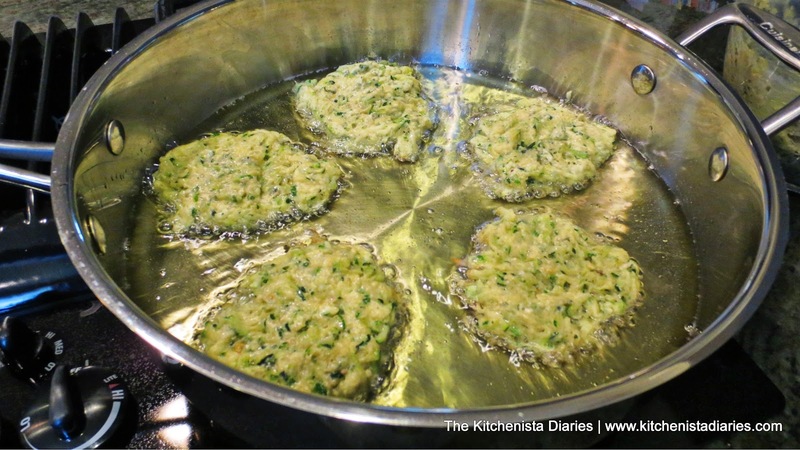 After a couple minutes, flip the fritters over. They should be golden brown on each side before removing. Keeping them around this size helps to ensure that they cook all the way through at the same rate as the outside crisps up. It's always important that oil is at the right temperature when you are frying. If it's too hot, your food will burn on the outside before the center is cooked; too cool, your food will absorb too much oil and become soggy and greasy instead of crisp. When the fritters are cooked, transfer to a paper towel lined plate. Sprinkle lightly with a pinch of salt while hot. 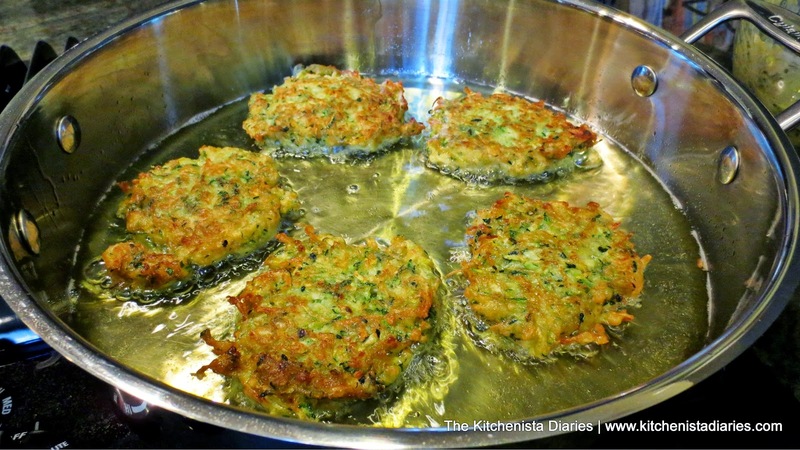 Continue cooking any remaining fritters, being sure to allow the oil to heat back up between batches. These fritters are best served right away while they are hot! You can reheat leftovers, but I find that they don't get crispy the second time around. 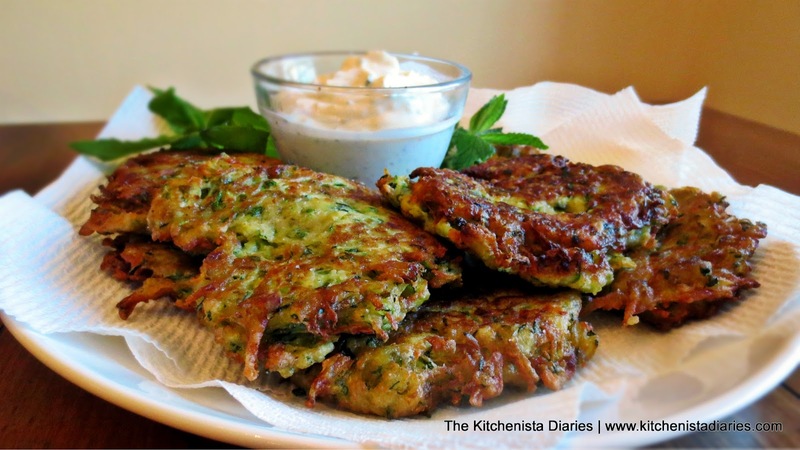 I love how the fritters are crispy on the outside but tender and creamy inside with all that lovely zucchini. 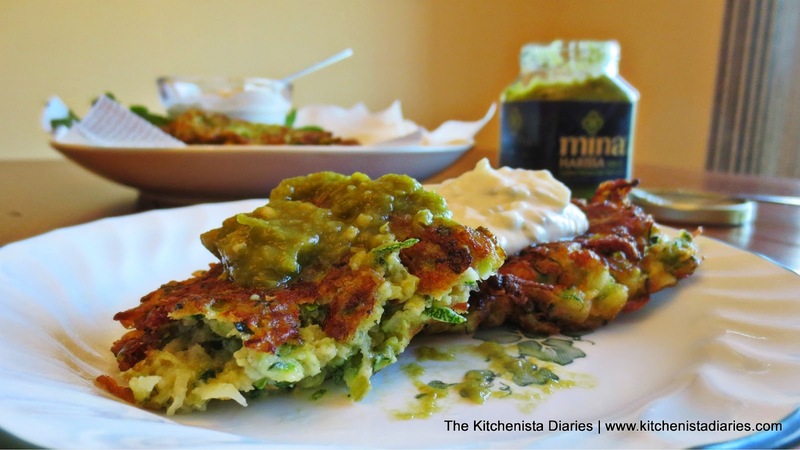 Mina's green harissa adds just the right flavors to take a regular zucchini fritter recipe to the next level!